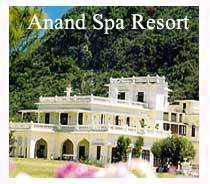 Ananda Himalayas also known as Ananda Spa Resort is one of the finest rejuvenation places in the world. It is located near Rishikesh in the Indian state of Uttaranchal. India Hotel and Resort offers complete information about Ananda Spa Resort, Ananda in the Himalayas, a leading spa and resort operating in Narendra Nagar. The Ananda Spa Resort is located at an altitude of 21,000 sq ft. the resort offers more than 79 different varieties of body and beauty treatments. It makes a healthy combination of Ayurvedic treatment of the Vedic Aryans and the contemporary western Spa techniques. The schedule of the personalized therapies and activities are designed according to an individual's needs including anti-aging, deep relaxation, de-stress, detoxification and cleansing and weight and inch loss. It also offers guidance for nutrition and exercise. The rooms at Ananda Spa Resort are designed keeping in mind that the natural Himalayan light enters the room and one can view the mountains while sitting inside. The guest rooms offer the intoxicating views of the valley and the city of Rishikesh or the Palace. The d�cor of the rooms is minimalist and holistic with wooden floors counterbalanced by necessary furniture, walk- in closet. The bathrooms are well lit with marble flooring and sunken bathtub facing the bay windows offering beautiful outside views. The rooms have independent patio balcony to relax, practice Yoga or just savor the beauty of the Himalayas. The Vice regal Suite is located in the Palace Annex spanning over an area of 220 sq km. The d�cor of the rooms give an authentic Indian touch. The suite has a spacious dining and seating room with seating facility for six people, bedroom having four-poster bed, dressing room and separate room for shower and steam. There is an outdoor Jacuzzi and a telescope also. The one-bedroom Deluxe Suites are located on the first and the third floor while the Ananda Suite is on the ground floor. The rooms have a separate dining and living room. The Ananda Suite has its own private garden also. All the Suites have a private bar, a walk-in closet, in-room safe, tea\coffee machine and telephone with data port and voice mail. The bathrooms have bay windows, bathtubs and separate shower. The Pavilion is located in the restaurant building and an ideal for cozy gatherings. It is a nice place for casual drinks and light snacks. The bar is well stocked with the finest wines and liquors. The Tree Top Deck is built over treetops to experience the majesty of the Himalayas, fresh air and open sky while having your meals. The nights are perfect for a romantic dinner in the company of the fireflies and crickets. The Maharaja Tea Lounge at the Vice-Regal Palace has a setting to remind you of the British Period. The walls have the portraits of the erstwhile maharajas and other politically prominent people who visited Narendra Nagar during the time period of Maharaja. The signatures and the pictures of the Lord Mount batten, the last Viceroy of India is bound to catch your attention. You can have a cup of tea and snacks at the royal card table, which have enclosures made of glass.